A Michigan couple on a fixed income saved up to purchase a $2500 minivan from a seller on Craigslist. But when the seller gave them a false title and the minivan turned out to be stolen, they were out a car and their money. Now a local dealer has stepped in to donate a car and make things right. 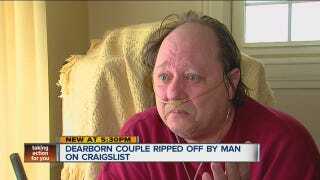 According to local news affiliate WXYZ.com, Mark Rakowski and his wife were scammed by a Craiglsist seller who sold them a stolen car. Mark suffers from health problems that require him to transport his breathing equipment around. He and his wife had to put money aside for awhile to even afford what many would consider a "cheap" used car. They spotted a minivan on Craigslist that had about 100,000 miles and arranged to meet the seller to purchase the car. After paying $2500, they were on their way. However, when it came time to register it, the Michigan Department of Motor Vehicles told them that the car was reported stolen and would have to be seized by police. With no car, and no money, things were not looking good for the Rakowski's. When Right Way Automotive, a local used car dealership, heard about their story they contacted the Rakowskis's and told them they could have a 2007 Chrysler Town and Country free of charge, complete with complementary oil changes and a six month warranty. Authorities are still looking for the man who scammed the Rakowski's and warn car buyers that they should use caution when purchasing from private sellers. Buyers should make sure the seller's title is legit and if at all possible have the transaction completed at the local DMV to confirm the paperwork. Kudos to Right Way Automotive...sometimes the name says it all.